1-How does it work from start to finish? 2-How does a transport work? 3-What if the car is damaged? 4. What is the best size carrier to transport a vehicle on? 5. Is the vehicles auto insurance primary or secondary? 6. What does DOOR-TO-DOOR delivery mean? 7. Do I have to be present when my vehicle is picked up or delivered? 8-Will my vehicle be driven? 9. How do I check on the status of my order? 10-What type of Transporter will my vehicle be shipped on? 1.How does it work from start to finish? Once you place your order and submit paperwork, the transport of your vehicle will be scheduled according to the dates on your shipping order. After a truck has been assigned, you will receive a call from the driver to schedule the pick up time and date. When the driver picks up your vehicle he will do a detailed inspection of your vehicle on the bill of lading. You both will sign it and you will receive a copy. The same bill of lading will be present on delivery so you can re-inspect the vehicle. The driver will call you 12 to 24 hours in advance to schedule an approximate time for delivery. 2. How does a transport work? Auto Transport is simple. You should receive a call from the carrier driver anywhere from 10-24 hours before the carrier arrives to pickup your vehicle. The driver will arrive and review the vehicle with you, go over and have you sign a "Bill of Lading" with you, and load your vehicle. The driver should call again before delivery, inspect the vehicle with you and have to take delivery signing the receipt. After the vehicle is unloaded, check the condition against the original copy on the Bill of Lading (BOL). If there is damage, point it out to the driver and mark it on your copy of the BOL. When you sign the delivery receipt, you accept your vehicle in apparent good condition, except as noted on receipt. You have the responsibility to examine the vehicle for damage no matter what time the vehicle is delivered or weather conditions. Feel free to take pictures, use camera and/or flashlight. Obtain your receipt of the BOL and ask the driver for contact information to submit the claim. Review the Carrier’s Bill of Lading thoroughly and be sure to follow the directions completely. Primary and secondary insurance is not questionable when it comes to auto transport. The auto transport carrier is the main coverage protecting your vehicle. The carrier holds insurance that covers anything done to you vehicle while in transit, except acts of nature. Personal content in the vehicle, not permanently attached, are not covered by carrier insurance. Door-to-Door means the carrier will get as physically close as possible to your front door. If you live on a main road, at least two lanes wide, with no overhanging trees or low bridges and the streets to your house can accommodate the carrier and he is able to make it to your front door than he will do so. As the carrier approaches your pickup or delivery location the driver will confirm address and discuss accessibility. Please inform your carrier if accessibility is limited and make arrangements to meet at a local grocery store for ample space needed. Yes, you or your designated representative must be present when the carrier arrives for pickup and delivery of your vehicle in order to go over the "Bill of Lading" to be signed. Your vehicle will only be driven to load and unload your vehicle from the carrier. Usually no more than 5 miles will be put on your vehicle during transport. Please note the mileage on your pickup and delivery inspection form "Bill of Lading". You may email or call us to request tracking information on your vehicle. Most of the time, your vehicle will be transported on an OPEN car hauler that may fit 8-10 cars. These are the types of trailers used to transport new cars to automotive dealerships. The trucks are much larger than cargo moving vans or semi trailers. 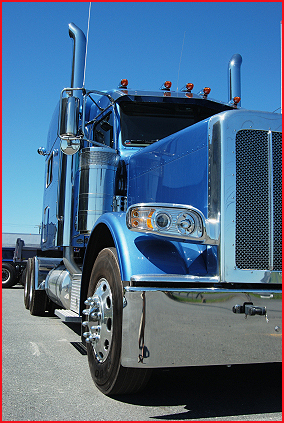 They are only allowed 80,000 lbs weight limit including truck, trailer and cargo by DOT regulations. So it is important to note that average car weight of (2,500) lbs (not including SUV’s) combined with the average weight of the truck/trailer (45,000) lbs is almost always at capacity. Therefore personal items that add additional weight should never be left in your vehicle. An ENCLOSED Carrier is quite different and always much safer and usually more costly. An enclosed hauler may only fit 4-6 cars depending height/length and is also much larger than moving vans and semi trailers. They are equipped with a hydraulic lift gate for ease of loading/unloading. The vehicle is held in place by a nylon wheel strap (soft-tie down) while transported on air-ride suspensions trailers to cushion the ride through rough roads. Keep in mind because of the height of these trucks, and lack of maneuverability, they may not travel onto rural streets or areas that may have low hanging streets or low clearance bridges. It may be possible for you to meet the driver at a designated place or utilize a local service with a flat-bed to reach your exact location for pick-up or drop-off. Should you wish to have your car transported via enclosed carrier, regardless of the extra costs please contact us to discuss further.